With our Facility Documents feature, you can now define a set of "Official Facility Documents" that appears on every provider's Facility Documents tab by default. With this new feature, you can completely customize the set of Facility Documents you normally log across all your providers. This helps you remember to log your core set of facility documents across all your providers, without having to create each document for every single provider. To create this default set of Official Facility Documents, simply go to Settings > Facility Documents, and press the "create new document" button. You can create as many Official Facility Documents you need. After creating your set of Official Facility Documents, go to your Facility Documents tab, and you'll see your custom list of these document ready to be logged. All your other logged Facility Documents will be grouped under "Uncategorized". There are 2 ways to see who of your Providers still needs their Official Facility documents logged. The easiest way is the Needs Input bucket. If you go to Settings > Credentialing Requirements, you can check the "Official Facility Documents" option to be included in the Needs Input bucket. By choosing this, any Provider who doesn't have their entire set of Official Facility Documents logged will appear in the Needs Input bucket. You can also use our new Missing Items report to get a list of all your providers are are missing any or all of your Official Facility Documents. Simply, go to Reports > Missing Items, click the report filter for "Facility Documents" and click the filter immediately to the right of it to search all your Providers who are missing those selected documents. Hope you enjoy this upgrade to our Facility Documents feature! 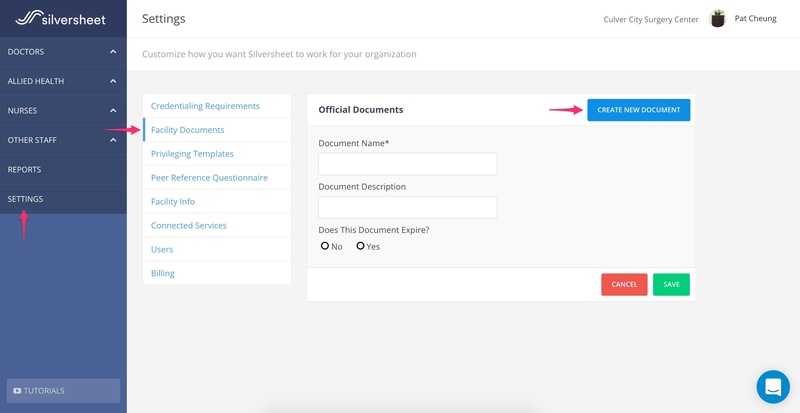 We're continually working on this feature, along with our entire Silversheet product, to make your credentialing work more efficient.